For Windows Developers who need to advanced media player with overlay text, image, add audio effects, dual display with C#, C++ , VB.Net , VB, Delphi, Vfp, MS Access. Support volume boost and Auto Gain, Normalize, surround control, voice control features. Support change the left audio channel, right audio channel or both audio channels. Use this feature can remove the vocals from Karaoke video. Support Overlay Flash File(swf file) on video and keep the transparent color. Support step backward and step forward frame by frame. Support output video and audio signal to Decklink cards. Support get the Video/Audio Information, e.g. Video bitrate, Audio bitrate, Audio Channels, Audio Sample Rate, Frame rate, Video Width, Video Height, Container Name, Video Codec Name, Audio Codec Name, Number of video stream and audio stream information. Support select specific decoder or filter some decoder (A user might install several decoders that are capable of decoding a particular file), you may add specific decoder to blacklist or whitelist. Support list all filters for current graph. Support list all third party decoder available for particular file. This information is useful when some media file cannot playback correctly. Allow select audio streams when playback vob,mpeg2 file. Support Audio effects,including ParamEq, WavesReverb, Gargle, Compressor, Distortion, Echo, I3DL2Reverb, Flanger, Chorus. Support dual display feature, the video will display full screen in monitor 2. Fast AVCHD decoder, Support Real-time, high resolution AVCHD 1920x1080 video playback and Deinterlace field interpolation. Video Color Adjustment, contrast, brightness, invert color, saturate, hue, lightness. Load video from memory, Byte Array. Allow display secondary video window, displaying two video window in same time, display pic in pic effect, adjust floating popup window\'s position. Allow select different audio renderer / audio device when playback. WMV, ASF, WMA support change playback rate. 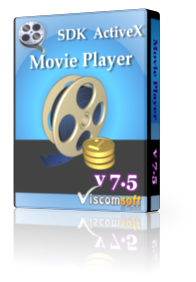 Including vob, flv, mpeg2, mov, mp4, m4v, 3gp decoder (Do not need download third party codec pack, some third party codec pack is illegal) . Overlay text and bitmap on video in same time. Multi-Line Scrolling text on video. Video Mixing, you can mixing multiple video and playback in same time. User define alpha channel, the area of video layer. Allow change the audio pitch to male, female, child voices. Useful for karaoke software. Allow change the audio tempo to speed up or slow down the song. Change the audio tempo , it can speed up or slow down the wmv or asf playback rate. Draw Overlay text on video . User define scrolling type, alpha value, font size, font name, text color, background color, transparent color. Draw Overlay image from disk or byte array on video. User define scrolling type, alpha value, transparent color. Audio channel selection. ( both, left, right channel). Custom define cursor on video. Custom Playback rate. normal playback speed, half speed, twice speed, etc. Custom View, Full Screen, Double Size. Allow define specific keyboard key or mouse button to clear the full screen. Fast Snapshot to BMP, JPG, GIF, TIF, PNG from movie files. (MOV, MP4, 3GP,DIVX, AVI, WMV, MPEG-1, MPEG-2, ASF). Snapshot to memory( Picture Box, HBITMAP handle ) from movie files. (MOV, MP4, 3GP,DIVX, AVI, WMV, MPEG-1, MPEG-2, ASF). Include c# 2005 sample, VB.Net 2005 sample, VB.Net 2003 sample, Visual Basic sample, Visual C sample, Visual Foxpro sample, Delphi sample and Web Page sample. Royalty free distribution of the OCX file. added support playback WebM video, H.265 video. updated DIVX AVI,WMV,WebM, MPEG2, VOB, MPEG1, M2TS, MKV decoder, now support count the number of audio tracks, get the audio track name and select playback specific audio track . added support step frame backward and forward (frame by frame) in DIVX AVI, WMV, WebM, MP4, MOV, M4V, MPEG2, MPEG1, VOB, M2TS, MKV, DIVX video files. added DIVX AVI decoder, now playback DIVX AVI file, it does not need installed divx codec. fixed MP4 decoder, when preview the MP4 video, At the end some frame are missing. renamed MP4SelectStream, MP4GetStreamName, MP4GetStreamCount methods to AudioTrackSelectStream,AudioTrackGetName, AudioTrackGetCount methods. removed VOBSelectStream, VOBGetStreamName, VOBGetStreamCount methods. Now use AudioTrackSelectStream,AudioTrackGetName, AudioTrackGetCount methods. improved change VOB audio stream speed when preview, In old version need about 10 seconds. Now need 1-2 second only. fixed cannot snapshot issue when set UseVMR9 = False. added allow select audio track, step backward and forward with C# 2015, C# 2010, VB6, VB.NET 2010, VB.NET 2015, VC General, GeneralVMR9 sample. added support unicode file name for AVI, WMV, MPEG1, DAT, MPEG2, VOB, WAV, MP3, MID, MOV, MP4, FLV, F4V, DVIX file. added read chapters features from video file. e.g. MP4 , MKV file. Get the chapters name and time and go to specific chapter. 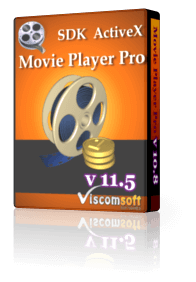 compatible with latest Video Edit Gold SDK dll files. You may using both control in same form. remove viscomwmvp.dll in installer, set default value of UseMsWMVParser property is true. Fixed cannot playback some wmv file issue. added ChapterOpenFile , ChapterReadChapterCount, ChapterReadChapterName, ChapterReadChapterTime, ChapterCloseFile methods. added VB6, VB.NET 2010 ReadChapter sample. fixed flash overlay crash issue when run on delphi. added delphi samples, decoder filter, flash overlay, volumeboost samples. fixed playback some MP4 video, it have gray screen. fixed playback some MP4 video, the displayed video is played too slow and jerky. rewrite MP4 decoder, now get good performance and quality. fixed cannot playback MPEG2, VOB video on Windows 8 and Windows 8.1.
added VolumeAudioChannel property that allow change the left audio channel, right audio channel or both audio channels. fixed display black screen when playback some MPEG file. added VMR9BiLinearFilter property that allow use VMR9 bilinear filtering or point filtering. added VB6, VC , VB.NET 2010, C# 2010\'s volumeboost samples. added new MP4, MOV, M4V decoder, now it can playback these video without installed quick time player. added support change playback rate of MP4, MOV, M4V videos. fixed decode video issue when create multiple instance of ActiveX. fixed cannot snapshot when useVMR9 = false and overlay flash file. added Support volume boost and Auto Gain, Normalize, surround control, voice control features. fixed cannot playback vob file on windows 7, windows 8 if third party mpeg2 decoder installed. fixed open same video few times, sometimes crash issue. fixed cannot playback vob file when you VMR7. added UseVolumeBoost , VolumeAutoGain , VolumeExpandStereo, VolumeGain, VolumeNormalize, VolumeNormalizeMatrix, VolumeVoiceControl properties. added vb6, vb.net 2010, c# 2010 volume boost samples. fixed when playback MKV video and set VMR9=false, the duration is 0 issue. added when display secondary video window, called SetVideoWin3Show( true), it allow use ChangeBrightness, ChangeContrast, ChangeHue, ChangeInvertColor, ChangeLightness ,SetLayerValue with secondary video window now. improved loading video speed when use video mixing (AddLayer). added support playback flash file (swf file). added support Overlay Flash File(swf file) on video and keep the transparent color. added support step backward and step forward frame by frame. added Support output video and audio signal to Decklink cards. added ExternalRenderer, UseExternalPlayoutCard, UseFlashOverlay properties. added ExternalPlayOutGetRendererCount , ExternalPlayOutGetRendererName, FlashOverlayAdd, FlashOverlayClearAll, StepFramePro method. added allow use VMR 7 or VMR9 Renderer, some computer cannot use VMR9 Renderer, so use VMR7 Renderer feature is useful. added AVCHD decoder support .mts, .m2t extension. added digital signed for ocx and exectuable of installer files. added c# 2010 and vb.net 2010 samples and fixed cannot run on 64 bit OS issue. added support get the Video/Audio Information, e.g. Video bitrate, Audio bitrate, Audio Channels, Audio Sample Rate, Frame rate, Video Width, Video Height, Container Name, Video Codec Name, Audio Codec Name, Number of video stream and audio stream information. Fixed cannot playback some F4V video and it seem have slow motion issue. added AudioBitrate, AudioChannels, AudioSampleRate, AudioStreamCount, AudioStreamFormat, MediaContainerName, VideoBitrate, VideoStreamCount, VideoStreamFormat properties. added StreamingAutoPlayAfterBuffered, StreamingGetDownloadedSize, StreamingGetFileSize, StreamingLoadFromURL, StreamingPause, StreamingPlay, StreamingSetPos, StreamingStop methods. added OnStreamingBuffered, OnStreamingErrorMsg, OnStreamingStatus events. added support select specific decoder or filter some decoder (A user might install several decoders that are capable of decoding a particular file), you may add specific decoder to blacklist or whitelist. In past, the user may not playback some media file when multiple decoders are available, because windows uses the Intelligent Connect algorithm to select the decoder. added allow unload the video, clear the screen. added DecoderAdd2BlackList, DecoderAdd2WhiteList, DecoderClearBlackList, DecoderClearWhiteList, GetCurGraphFilterName, GetThirdPartyDecoderCount, GetThirdPartyDecoderName, GetDecoderFilterType methods. fixed playback m4v file cannot hearing the audio issue. updated f4v, flv decoder, fixed cannot playback some f4v, flv files issue. added allow select audio stream when playback multi-language or karaoke vob or mpeg2 file. added allow list all streams for vob or mpeg2 file. added allow use microsoft wmv parser, it may solved cannot playback some wmv file issue. added VOBGetStreamCount, VOBGetStreamName, VOBSelectStream methods. fixed load mp3 file, it cannot return correct duration issue. improved playback CDG file, cannot hear the audio issue when installed third party karaoke CDG filter.